Apple's iPad Pro is official, but it's not coming alone: Apple has also revealed a Smart Keyboard, which looks a little familiar, as well as an Apple Pencil. Yes, really. Apple knows that the iPad screen isn't ideal for typing long documents. The Smart Keyboard is the answer to that problem, and you'd be forgiven for noting that it looks incredibly similar to the Microsoft Surface keyboard. Three small circles on the side of the iPad Pro connect to the keyboard, triggering iOS 9 to automatically adapt. The keyboard will be available separately for $169 rather than bundled with the iPad Pro. The iPad Pro still has multi-touch, of course, but Apple is introducing a stylus called the Apple Pencil. You can use the pencil to produce different weights of stroke depending on how hard you press. No, this is not a joke, and it will cost $99. 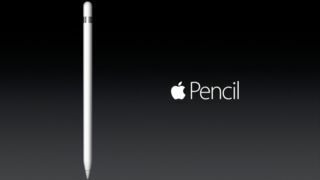 There's even a video of Jony Ive seductively describing the design of the pencil in great detail. "If you see a stylus, they blew it" – Steve Jobs, April 8, 2010.